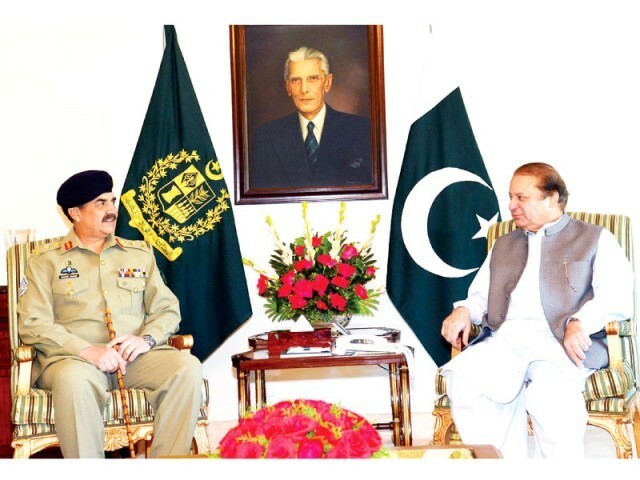 On Wednesday, 14 May 2014, Pakistan's Prime Minister, held a high level meeting in Karachi on the issue of operations in Karachi. In this meeting of the military and political leadership, including federal and provincial governments, Chief of Army Staff, Corps Commander Karachi and Director-General of the Inter-Services Intelligence (ISI) were present. Through this high level meeting Raheel-Nawaz regime gave an impression to the people, that the terrorist are so strong that the police and Sindh government cannot tackle this menace, rather the country’s top political and military leadership has to come together in order to get rid of them. And they tried to give an impression to the people that the Raheel-Nawaz government is serious in securing the lives and property of the people. In fact the Raheel-Nawaz government will fail to end terrorism and establish peace in Karachi because Raheel-Nawaz government is trying to put the blame of this failure on illegal mobile SIMS, small time thugs and other marginal issues. However, the actual cause of this failure is the freedom that has been provided to the American intelligence and Raymond Davis network to plan and oversee the execution of terrorist activities in Karachi and the whole country. This fact is substantiated by the fact that in Karachi, army officers, lawyers, ulema, doctors and the common people are not secure from terrorist activities, whilst American officials and activists roam around the city without any fear of terrorist activity. Recently, an FBI employee was arrested at Karachi Airport, carrying weapons and espionage gadgets, yet Raheel-Nawaz regime quietly facilitated his bail as a service to America. Yet another proof that terrorism and insecurity in Karachi is because of the American intelligence and Raymond Davis network. If the Raheel-Nawaz regime orders were to order security personnel to uproot American intelligence and Raymond Davis network, which are the biggest criminal gangs in the city, peace can be restored in the city in few weeks, if not days, and the smaller criminal gangs would then run for fear of their lives. However, the Raheel-Nawaz regime will never take this step because American interests are dearer to them then the peace and security of their people. Whether it is dictatorship or democracy, both have pushed Karachi into fires of chaos, in order to safeguard American interests. Insecurity in Karachi, Pakistan and the region is because of the American presence. The people of Pakistan and its armed forces must know that neither democratic nor dictator rulers will ever order the elimination of the American intelligence and Raymond Davis network from Pakistan. This will only be done by Khilafah state because its Islamic constitution declares America as an enemy state as, compared to current constitution which declares America as a friendly state. Therefore sincere officers in the armed forces must come forward and provide Nussrah to Hizb ut-Tahrir for the establishment of Khilafah in Pakistan which will erase every form of American presence from Karachi, Pakistan and this region and will restore peace and security to these Muslim Lands.